I quite enjoyed George Roux’ book, Ancient Iraq, about the history of that geographic area from roughly 3000 BC to 500 BC. Since reading that book, ancient art sections of art museums have been much more exciting. Art and sculpture from the Assyrians and the Hittites has come alive. In traveling about Turkey, I took a boat ride that stopped at an island so we could take a walk. 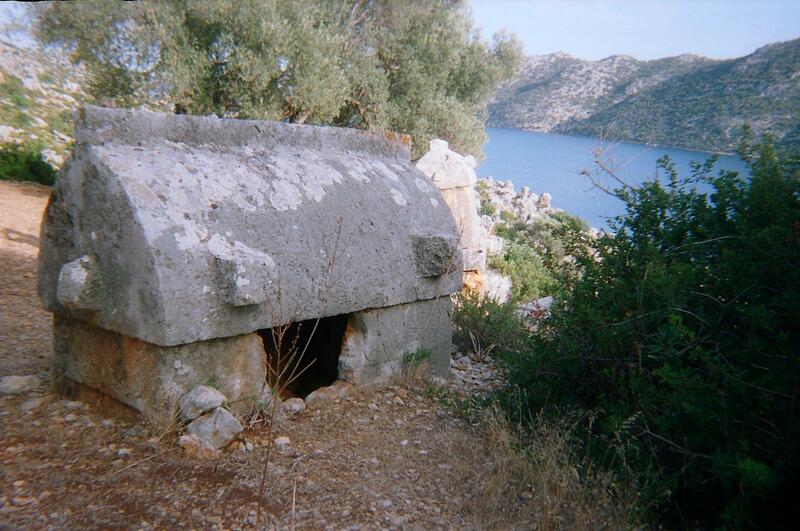 It was most memorable because here and there, were Lycian tombs. I recalled Mr. Roux’ reference to the seafaring Lycia back in the day. These tomb structures were big and formidable. What a perfect prop for hide and seek. The guide books said these tombs would have been those of sea captains. I found the stone vaults much more intriguing than the Lycian cave tombs of later ancient times. Why? I think it was that Mr. Roux’ book brought these seafaring people out of antiquity and made them real. And I could relate to this cemetery look.